Is Falling a Possible Warning Sign of Dementia? Falls are one of the most common causes of injuries among seniors. For many families, a fall is a sign they need to assess their senior loved one’s current state and decide if he or she needs more help. One of the biggest concerns is that a fall might be a warning sign of dementia. Before you automatically conclude that your loved one has dementia, it’s important to understand the link between falling and senior health conditions. How Does Dementia Cause Falls? It’s true that dementia can be a possible cause of falling. The brain has difficulty properly regulating movement, so seniors with dementia may begin to shuffle or walk erratically. Due to confusion and difficulty thinking logically, seniors may not remember to do things like lifting up their legs when walking over thresholds. Cognitive decline can also cause problems because seniors may try to move as if they’re still in their 30s and attempt to do things their aging joints and muscles cannot do anymore. Does Confusion After a Fall Mean a Senior Has Dementia? One of the big reasons many families worry about dementia after their loved one falls down is that he or she may seem groggy and confused. Keep in mind this is often just due to the fall itself. If your loved one hits his or her head, it may take a few months to recover completely. In the recovery period after the fall, your loved one may be taking pain medications that alter his or her personality or critical thinking skills. Try to give your loved one time to heal before concluding that he or she might have dementia. If your loved one does sustain an injury, a professional caregiver can help him or her recover safely and comfortably at home. Although it may be challenging to find reliable, highly rated home care, Carmichael, CA, families can turn to Home Care Assistance. Our respite and live-in caregivers are expertly trained to assist seniors with a wide array of important tasks, including cooking, bathing, light housekeeping, and exercise. What Other Health Issues Can Cause Falls? The main reason you shouldn’t automatically assume a fall is due to dementia is because falls can have many other underlying causes. In some cases, falls may be a sign of vision impairment. They may also be a symptom of Parkinson’s disease, which impairs movement and can cause a shuffling gait. There are many other senior health conditions, such as arthritis and osteoporosis, that can cause falls, or they could simply be due to the general decrease in coordination, balance, and strength seniors often face. Certain age-related conditions can make it more challenging for seniors to age in place safely and comfortably, but Carmichael live-in care experts are available around the clock to help seniors manage their health. Whether your loved one is living with dementia or is recovering from a stroke, you can trust the professional live-in caregivers from Home Care Assistance to enhance his or her quality of life. How Do You Tell if Your Loved One Has Dementia? 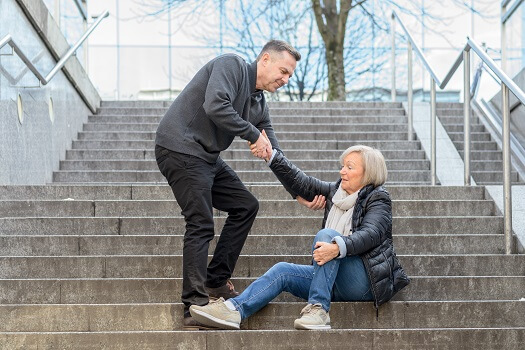 Falls don’t definitively mean a senior has dementia, but it’s generally a good idea to talk to the doctor about doing a dementia screening after any major fall. To figure out whether a fall is a warning sign of dementia, you need to see if your loved one is exhibiting other signs of dementia. The signs of dementia can be difficult to notice, especially in the early stages. Some seniors may exhibit personality changes or lapses in judgement, and others may become more forgetful or find it difficult to manage multistep tasks. If your loved one is experiencing frequent falls, no matter what their cause, having a trained professional caregiver close by can provide you and your family with much-needed peace of mind. Not every senior has the same care needs, which means they don’t all need the same type of home care services. Carmichael families can rely on Home Care Assistance to provide individualized care plans to meet your elderly loved one’s unique care needs. Our holistic Balanced Care Method was designed to help seniors focus on healthy lifestyle habits such as eating nutritious foods, exercising regularly, and maintaining strong social ties, and our Cognitive Therapeutics Method offers mentally stimulating activities that can stave off cognitive decline and delay the onset of dementia. For more information about our flexible, customizable home care plans, call one of our compassionate Care Managers today at (916) 485-4663.